This year, the hotel has undergone a mammoth refurbishment and the results are truly outstanding. 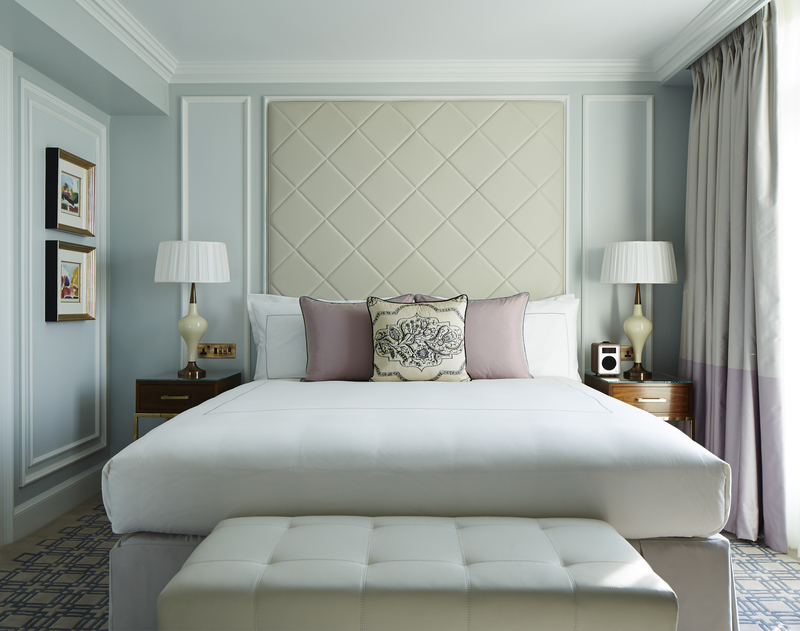 A calming colour palette of dusky lilacs and glossy neutrals is the perfect antidote to Oxford Street’s hustle and bustle and extends right the way through the hotel, from the lobby to all of the 152 rooms, nine of which are premier suites. 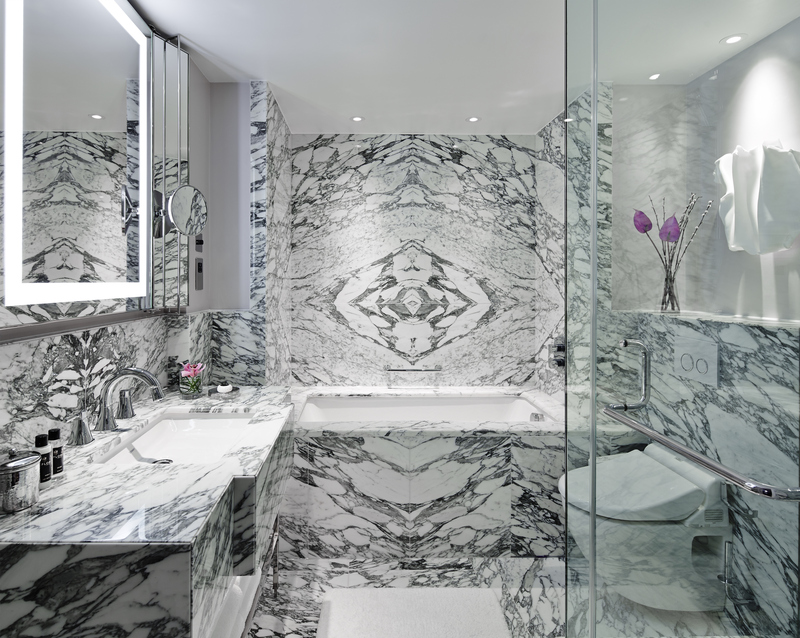 Paired with the room’s sleek and spacious marble bathrooms, complete with complimentary Floris products, Marriott have achieved hotel nirvana: a home from home, resolutely residential rather than corporate stabling, undoubtedly, by the staggering amount of expertly curated artwork on display. Request a room looking out onto the park; we stayed in one of the Junior Suites, which are the ideal size for a weekend away. Thankfully, special glazing means that your ears will be oblivious to the never-ending London traffic speeding around Marble Arch directly outside your window. The hotel’s on-site restaurant, Lanes of London, is also open to the public. Accessed via the hotel lobby or from its own entrance on Park Lane there is a busy bar – try and snag one of the cosy window booths – and relaxed dining area. Low ceilings contribute to the private member’s club atmosphere. The food itself is simple but where Lanes, and the hotel, really excels is in it’s approach to customer service. For Marriott hotel members there is an executive lounge, open all day, serving various light bites but the standout option for us was the in-room dining service. Come morning, order homemade waffles and fresh juice to enjoy in the comfort of your own room. Until December 31 the hotel has partnered with Selfridges Oxford Street, to offer an exclusive shopping experience for guests. The package, available upon booking, includes access to the department store’s VIP area and Executive Lounger and a complimentary glass of champagne at Harry Gordon’s Bar and Kitchen. When we visited one of the store’s helpful assistants was on hand to advise on several important purchases and squirrel bags away into the cloakroom, leaving us unburdened and able to run riot around the shop. The relationship between the hotel and Selfridges is well established and the shopping experience, if you are unable to make it this year, is set to return in 2016. Double rooms start from £399 per night. Visit their website for more details or call 020 7493 7000.